Without a doubt, hostas have gained much popularity among gardeners in recent years. Hostas have been grown widely for the beauty of their decorative foliage that comes in myriads of shapes, colors and textures. Just a few of their many different leaf shapes include those that are heart-shaped, oval, lance-shaped, and cup-shaped. Hostas also boast a wide array of foliage colors that include many shades of green, bluish- gray, yellow and white, striking chartreuse, and variegated colors. Sizes and shapes of hostas vary from several inches across to several feet. Their flowers are typically either bell-shaped or trumpet-shaped and bloom in a wide range of colors. Some are white, many in hues of lavender and lilac, pale mauves and deep purples, and a host of other colors. Some hostas produce flowers on tall spiked stems, while others bloom just above the plant's foliage. It can be hard to keep abreast of the many new garden varieties of hostas available these days. They continue to increase in number and there are literally hundreds of varieties for gardeners to choose from. To see some of the newest varieties available, spend a little time perusing some of the specialty garden catalogs. Hostas (Funkia), also known as plantain lilies, need not be confined to being grown exclusively in garden plots. This should be great news for those of you hankering to have a few handsome hostas, but lacking a conventional garden in which to grow them. And, for those who DO have a prosaic garden, but it simply isn't an appropriate habitat for a host of hostas, take heart! There is no reason why hostas can't be grown in containers just as successfully as an exotic hibiscus. Their wonderful foliage lasts from spring through summer and into late fall. Just imagine the harmony of colors, shapes, and textures you can combine when planting them in containers of varying shapes, sizes, and colors. As with any plants grown in containers, there are some important guidelines you should follow, especially when growing hostas. Choosing containers that are proportionate to the mature size of your hostas is of prime importance. It would be wise to learn the ultimate mature size of each hosta you choose before purchasing its container. Hostas are ideal when planted as single specimens, especially if you have limited space. For single specimens, large decorative terra cotta pots are a great choice. Hostas also make dramatic and colorful foliage displays when different varieties are planted in individual containers, then grouped on patios, balconies, decks, or beside swimming pools. Let yourself be creative when choosing your containers; don't limit yourself to just one shape, color, or design. The old adage that variety is the spice of life still holds true! It is also essential that hosta containers have adequate drainage. Although hostas do love and need plenty of water, they will not thrive in waterlogged containers, as their roots must have oxygen to survive. If you plan to place your hosta containers on your patio or balcony, be sure to select those having drip trays to catch any excess water. For optimum growth, hostas prefer humus-rich, well-drained soil. When planting hostas in containers, it's best to purchase a commercial soilless mixture. This soil is a mixture of peat moss, vermiculite and perlite, and while it retains more moisture, it also allows the proper drainage your hostas demand. Many such commercial soils are available at nurseries, garden centers, and many discount stores. Place several inches of Styrofoam packing peanuts in the bottoms of the larger containers that will be used for single specimen hostas. Doing this will serve several purposes. The Styrofoam peanuts will help provide additional drainage; you won't need quite as much potting soil; these larger containers will be easier to move as they won't be as heavy. Younger hostas can be planted in smaller containers for the first year, or until they begin to outgrow their pots. As they grow larger, transplant them into larger containers, where they can probably remain after reaching full maturity. If you plan to group them, plant one or two smaller varieties in small to medium sized containers, then plant several larger species of your choice in larger containers. It can't be emphasized enough that hostas simply can't tolerate direct hot sunlight. So, before dashing out to purchase a host of hostas to plant in your containers, take a little time to analyze the most suitable location for your shade-loving hostas. Depending on variety, the light needs of hostas can range from dense shady locations to partially sunny areas. The beauty of planting hostas in containers is that they can be moved from one location to another as needed. In early spring your hostas can probably tolerate a somewhat sunny location until temperatures begin to get quite warm. As summer arrives with its sizzling hot days, you will need to cater to your hostas by moving them into a more shady or semi-shady area. With the variety of foliage colors and textures to choose from, harmonizing a group of heavenly hostas should be a piece of cake. So let your creative juices flow freely as you begin to select just the right colors and textures to suit you! Hosta tokudama f. aureonebulosa -- This striking hosta boasts bluish green leaves and produces very pale blue flowers. It would be an excellent choice for a container specimen. Hosta tokudama -- features unusually charming chartreuse leaves blending beautifully with the hosta pictured with it sporting deep green leaves with white margins. 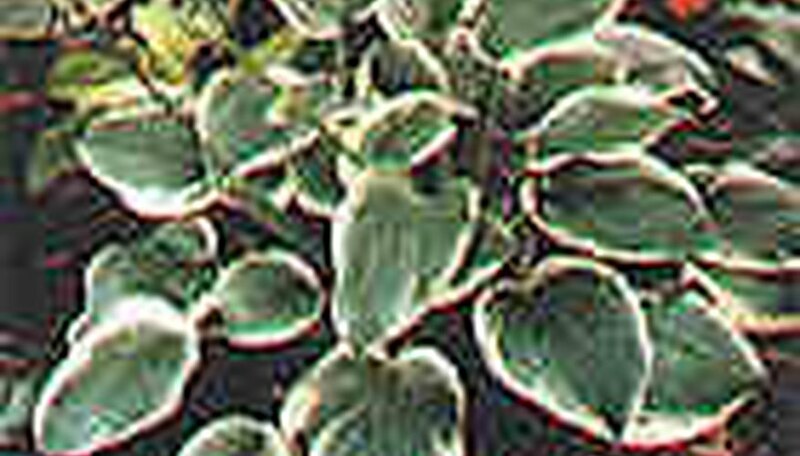 Hosta undulata -- has variegated leaves of stark white and dark green. This outstanding hosta produces dainty purple flowers. These are just a sampling of the many hundreds of varieties available. Visit your local nursery or garden center in very early spring for more great choices. Don't forget to scan some specialty catalogs that are available on many gardening web sites these days! For a bit of added interest and color, plant a few bright colored impatiens mixed with English ivy to trail over the edges of your hosta containers. Both are shade-loving plants having soil needs similar to hostas. Or, how about some ornamental grasses such as Hakonechloa, planted with or in separate pots placed alongside your hostas? Ferns and other plants having fern-like foliage will also serve to enhance your hosta groups. Hostas are very thirsty plants, and get even thirstier in containers. They like to be kept moist but not wet, and on very hot days they will require more watering than usual and on a regular basis. You may want to place a bit of mulch on the surface of your containers; this will help conserve moisture on hot summer days. Since you've chosen containers with adequate drainage, you should have less concern about your hostas becoming waterlogged. Since the nutrients in container soils are lost more rapidly because of frequent watering, a reliable slow-release fertilizer is appropriate for hostas, especially during their growing season. When using other types of fertilizers, apply regularly, always following the package labels. It is sad but true that slugs and snails enjoy feasting on the tender leaves of hostas. The good news is that you'll be at least one step ahead of them, as they'll have a harder time finding your hostas in containers! If by chance they do, you may need to apply either an organic or other reliable insecticide to control them. In some areas deer can a problem, as they too love hosta foliage, especially if other food sources are scarce. Deer repellents are available, but are usually only a temporary deterrent. Having a fenced yard or perhaps a great watch dog may prove to be a better solution. All hostas require a period of dormancy in the winter. You should plan to move your containers to a location where the temperature will be between 30 to 40 degrees during winter months. Any unheated place, such as a garage, barn, or even a back porch can serve as a good winter location. Containers should be only lightly watered during this time, and not be allowed to completely dry out. Although hostas in containers tend to sprout and grow earlier in the spring than those in gardens, they shouldn't be placed outdoors until the danger of frost has passed. When temperatures are well above freezing, it is safe to move your containers outside again. Hostas planted in containers can be a real delight. The diversities of their colors, textures, and shapes offer gardeners a wonderful opportunity to be creative. Isn't that really what flower gardening is really all about? Naomi Mathews has been writing since 1998. Her gardening articles appear on Garden Guides, ICanGarden and GardenHomeAccessories. Mathews also contributes to eHow and maintains two blogs. She earned a Certificate of Accomplishment in executive secretarial studies from Yakima Business College.. Hanging Baskets of Bewitching Begonias!